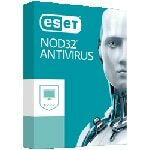 ESET NOD32 Antivirus for Kerio Control filters traffic from all inbound connections to protect your network from a host of Internet-borne threats, including worms, viruses, Trojans, spyware, and rootkits. NOD32 is easy to install, easy to renew and upgrade. Its sleek user interface is designed to let you easily set up all routine tasks. In addition, you can fine-tune your security profile with more than 150 detailed settings. ESET NOD32 Antivirus runs on any system with Microsoft Windows 10, 8.1, 8, 7, Vista, and Microsoft Windows Home Server 2011. Product requires an internet connection.